Animal behaviour depends upon integrated processes at the subcellular, cellular, and organismal level, and thus is susceptible of disruption by a broad spectrum of chemicals. Locomotor behaviour (movement) of the small free-living nematode C.elegans has proven to be useful in assessing toxicity. We can find literature about it in the field of Ecology, Pharmacology, Nanotechnology, Agrochemistry, drug development and many others. Toxicity measures are easily implemented using our WMicrotracker system. Below you’ll find a procedure example. In this experiment we can observe the effect of increasing concentrations of KCl in young adults N2 C.elegans. The recording of 12h of activity shows an immediate effect of this salt on behavior and deleterious effect at doses higher than 3.75g/l. Control worms were cultured in K buffer (32 mM KCl, 51 mM NaCl. Ref: Williams P). (1) Grow synchronized populations of worms in NGM plates. (2) Remove worms from plates using buffer. (3)Count #worms in 10ul, and adjust volume to get [5 worms/10ul]. 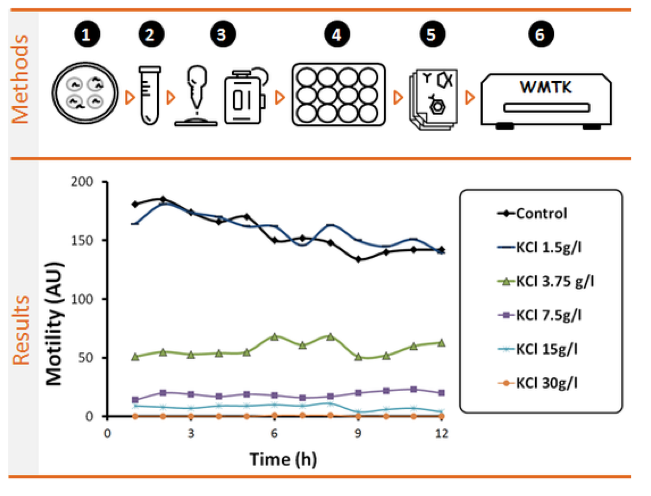 (4)Transfer 90ul of worm solution to 96 well microplates using multichannel pipette. (optional :)Let them rest for 1h and measure basal activity using WMicrotracker. (5)Add 10 ul of a 10x concentrated solution of chemicals to test. (6)Register worm activity using WMicrotracker.